The Ethanol Fuel Plant Design Competition was managed by the Long Range Planning Unit of the California Department of Food and Agriculture as part of the Department's Ethanol Fuels Program. This report was prepared under the direction of Vashek Cervinka, program manager, Steve Shaffer, program coordinator, and Neil Koehler, project manager of the Design Competition. The report was authored by Floyd Butterfield, the designer and operator of the selected ethanol fuel plant design and edited by the staff of the Long Range Planning Unit. The blueprints were prepared by Buchanan's Drafting Service in Paso Robles, California. Members of the Judging Panel in the Design Competition were Ron Alves, Modesto Junior College; Vashek Cervinka, California Department of Food and Agriculture; Tom Chester, Energy Consultant; Karol Goudelock, College of the Siskiyous; Jim Hall, Farmer; Bob Harper, California Waste Management Board; Jim Kerstetter, California Energy Commission; Walter Krenz, Oscar Krenz, Inc.; Tom Richardson, California Farm Bureau Federation; D. E. Robison, California State University at Fresno; and Henry Waelti, University of California at Davis. In 1981 and 1982, the California Department of Food and Agriculture and the California Waste Management Board jointly conducted the Ethanol Fuel Plant Design Competition. The objective of this competition uas to provide California fanners with construction and operation plans for a reliable and efficient farm-scale ethanol fuel plant already built and operating in California. After reviewing 17 submitted designs and closely monitoring the performance of three finalists, an 11 member judging panel representing government, universities, agricultural organizations and the ethanol industry, selected the Gildred/Butterfield ethanol fuel plant in Paso Robles as the winning design. The report that follows, authored by Floyd Butterfield, the designer and operator of the Gildred/Butterfield plant, documents the plant's design, construction, operation and performance. The Gildred/Butterfield ethanol fuel plant design is offered as one workable approach to ethanol fuel production. Though the design is adaptable to a variety of feedstocks and operating conditions, it may not be the most suitable design for every situation. Careful consideration of site specific factors including feedstock costs and availability, capital requirements, labor inputs, energy inputs and ethanol and co-product markets is critical in determining the technical and economic feasibility of any ethanol production project. Other viable advanced ethanol production technologies including continuous cooking and fermentation and vapor compression distillation are not part of the Gildred/Butterfield plant and consequently are not detailed in this report. These and other advanced technologies may be considered in conjunction with the Gildred/Butterfield design. Mr. Butterfield has added to the report his recommendations on potential improvements and variations on his as-built design. A number of these recommended refinements are now being incorporated into the Gildred/Butterfield plant as it undergoes continuous development. Special attention is called to the Notice and Disclaimer appearing on the inside of the front cover of this report. This material should be read carefully by all persons considering construction and operation of an ethanol fuel plant. This report provides detailed information concerning the design, construction, operation and performance of the Gildred/Butterfield Fuel Alcohol Plant. 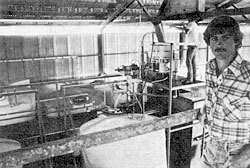 In January, 1982 this plant was awarded first place in the California Alcohol Fuel Plant Design Competition. The competition was sponsored jointly by the California Department of Food and Agriculture and the State Solid Waste Management Board. The Gildred/Butterfield Fuel Alcohol Plant is located on a ranch approximately six miles north of Paso Robles, California. It presently is in operation on a daily basis. The plant currently processes off-market barley, wheat and screenings, although it is adaptable to a wide range of feedstocks. For additional information on this plant contact Floyd Butterfield at 805-467-3417. Front-end handling involves receiving and storing the feedstock and preparing it for processing. The equipment in this portion of the plant may vary substantially for different feedstocks. The plant designer/builder should specify and select equipment suitable for the proposed feedstock. Grain may be received and stored in any of the commonly accepted ways. The first important step in processing for alcohol recovery is the reduction of the feedstock particle size. Size reduction will render the feedstock more susceptible to rapid enzyme breakdown and efficient mixing. In selecting a specific grinding technique, one must also consider the solid-liquid separating method used later in the process and the end-use of the processed feedstock. There are two basic types of mills for grinding grains -- the roller mill and the hammer mill. The roller mill is suitable for low-moisture grains that crack easily. On such feedstocks, the roller mill produces uniformly reduced grain with a low percentage of fines. A hammer mill can successfully grind a wider variety of feedstocks. Feedstocks should be ground with either type of mill to the point where finer grinding provides no further increase in alcohol yield or makes processed feedstock recovery uneconomic. If the feedstock contains foreign material (such as dirt clods, rocks, trash, etc.) it should be cleaned before being sent to the mill. Any mill should also be protected by a magnetic trap. For the plant shown on Plate l, feedstock receiving, storage and milling is done at another location. Trucks unload over a bottom-dump hopper and grain is augered into a 100-ton storage bin. As needed, the grain is milled by a 5HP roller mill, which is fed from storage by an auger via a scalper and magnetic trap. The ground grain is augered into a truck and transported to the plant. Following particle-size reduction, the feedstock is augered into the feedstock storage tank shown on Plate 1 (No. 28). From there it is augered into the scale hopper, weighed and then augered into the cook tank. The scale hopper shown on Plate 1 has only a 500 lb. capacity so it must be loaded several times for a typical 3000 lb. batch. A more efficient design would be to have the feedstock storage tank or cooker on a scale itself. Cooking involves the breakdown of the starch contained within the feedstock to sugar. This breakdown is accomplished by mixing the feedstock with warm water and enzymes and then injecting steam to further heat the mixture. The batch cooker shown on Plate 1 (No. 20) is a 3000 gallon mild steel tank. It is insulated with a minimum of two inches of urethane foam. The tank is positioned on two steel support pillars and tilted toward the outlet at an approximately 10 degree angle (Plate 3). The cooker is equipped internally with a 1-1/4-inch diameter, perforated steam line for direct injection of steam. The steam line runs the length of the tank and is positioned slightly off-bottom as shown. It has 1/8-inch diameter holes spaced 2.5 inches apart along its entire length. The steam line from the boiler to the cooker is 1-1/4-inch diameter and fitted with a globe valve for steam flow regulation and a check valve to prevent backflow to the boiler. A back-pressure regulator may also be required in this steam line depending on the other steam demands placed on the boiler during cooking. The cooker also contains a paddle-type mixer as shown in detail on Plate 3. The mixer shaft is coupled by a chain drive to a motor/gear reducer combination on top of the cooker. Inlets and outlets to the cooker are via 2-inch diameter, full opening ball valves and hose connections. The external heat exchanger (No. 19, Plate 1) is used to cool the contents of the cooker and to cool fermenters when necessary. It consists of a 2-inch diameter copper pipe within a 2-1/2-inch diameter copper pipe. The material to be cooled is pumped through the inside pipe while water flows through the annulus around the inside pipe and in the opposite direction. The smaller tube has baffles welded on its outside each 3 feet along its length to support it inside the larger tube and to create turbulent water flow. Connections to this heat exchanger are made via 2-inch hose connections. In the cooker, the starch contained within the feedstock is converted to soluble sugar. At this stage, the entire mash could be fermented. An alternative is to first separate the solids from the liquids after the starch has been converted to soluble sugar and then ferment the liquids only. The plant designer and/or operator must make this decision based on feedstock type and cost, by-product value, need for fermenter agitation, separation efficiency, etc. In any case, the solids and liquids are usually separated at some stage in the process. The plant shown on Plate 1 uses a two-stage separation process. First, the mash is pumped from the cooker to a Sweco separator (No. 13, Plates 1 and 2). This separator is a vibrating screen type. Liquids that contain fermentable sugar pass through the screen and discharge to one of the fermenters via a two-inch hose. The solids move off the screen and fall into the hopper of the screw press (No. 12, Plates 1 and 2). The screw press is shovn in detail on Plates 4 and 5. As the mash is augered through the press tube, the excess liquids that fall through the perforations are collected in the catch basin and pumped back onto the Sweco. The solids continue along the tube, are pressed in a short, augerless section at the end of the tube and then fall by gravity into the mash storage bin (No. 14, Plates 1 and 2). The pressed mash, at about 65% moisture, can be stored until enough is accumulated for transport or direct use. The mash is stored in a fully enclosed wooden box (No. 14, Plates 1 and 2). This box has a metal frame that is faced on the inside with 3/4- inch-thick plywood. The plywood should be treated with a moisture sealant. Mash falls into the box by gravity through a small door at the top. The bin can be emptied by opening the full-width doors on front and using a front-end loader. Carbon dioxide from the fermenters is piped to the mash storage bin. This keeps the mash fresh (for up to one month) until it can be used. Each fermenter (No. 8, Plates 1 and 2) consists of a 1700-gallon plastic tank. Each tank is positioned on a stand consisting of a two-inch box steel floor frame with two-inch diameter steel pipe legs. The stand tilts the fermenter toward the outlet at an approximately 7 degree angle. Each fermenter is equipped with a thermometer and a second, off-bottom outlet for drawing samples and mixing the fermenter contents with a pump. It may be desireable to equip each fermenter with a built-in mechanical agitator to help speed the fermentation and aid in complete tank drainage. Discharge from each fermenter is through a two-inch diameter hose via a two-inch, full-opening ball valve. The distillation section of the plant is shown on Plates 1 and 2 and in detail on Plate 6. The distillation column internals are shown on Plate 7. Following fermentation, each fermenter's contents are pumped to the beer well (No. 2, Plates 1 and 2). The beer well is a 2300 gallon plastic tank on a stand. During distillation, the beer is pumped continuously from the well by the beer feed pump (No. 10, Plate 1) to the tube-side of the condenser/preheater (No. 7, Plate 6). This is a 4-pass, tube-in-shell heat exchanger as specified in Appendix A. The beer then flows to the tube-side inlet of the second beer preheater (No. 1, Plate 6). From the outlet of this preheater, the beer is fed into the downcomer of the second highest plate in the stripping column. In the stripping column, the feed falls down the downcomer and impinges on the blank portion of the plate below (see illustration of sieve plates, Plate 7). It then travels across the perforated portion of that plate, over the outlet weir, and down the downcomer. After traveling down the entire length of the column and across each sieve plate, the resulting stillage is pumped through the shell side of the second stage beer preheater (No. 1, Plate 6) and to the stillage holding tank (No. 7, Plates 1 and 2). The purpose of the stripping column is to remove the alcohol from the beer feed stream. Steam is injected into the base of the stripping column. The rate of steam addition can be controlled by a pressure reducing valve. More accurate steam flow control can be obtained through the use of a temperature-controlled steam valve. The steam rises through the plate perforations and carries with it the alcohol in the feed and some water vapor. The vapors from the top of the stripping column proceed through the two-inch diameter exhaust tubing shown on Plate 6 and enter the base of the rectifying column. These vapors then rise through the perforations in the plates of this column and exit at the top, into the shell side of the condenser/preheater (No. 7, Plate 6). Since the condenser/preheater is only a partial condenser, the ethanol proceeds next to the air-cooled heat exchanger (No. 8, Plate 6). This exchanger completely condenses and may sub-cool the product slightly. The alcohol then flows by gravity through a single-pass, water-cooled, tube-in-shell heat exchanger (No. 10, Plate 6). By controlling the rate of water flow through this exchanger, the temperature of the alcohol entering the reflux drum can be maintained at a constant. These multiple condensers/subcoolers allow maximum beer preheat and minimize the use of cooling water. The reflux flow rate is controlled by a temperature-regulated valve whose sensor is placed in the vapor space at the top of the rectifying column (operating experience indicates that a more appropriate sensor position is approximately two-thirds of the way down the rectifying column). The reflux controller shown on Plate 6 (No. 12) contains a flowmeter to monitor the reflux flow. Ethanol that is not returned to the rectifying column as reflux flows out the overflow of the reflux drum and to the plastic, final product holding tank. Heat in the form of steam is supplied to the cooker and distillation section by a 10 horsepower, propane-fired boiler (No. 17, Plate 1). This is a fully packaged unit which contains all combustion controls and feedwater reservoir, pump and controls. Feedwater to the boiler must first pass through a water softener (No. 6, Plate 1) and should be preheated as much as possible. Feedwater preheat can be obtained from the stillage stream during distillation, from boiler exhaust gas, from water discharged from heat exchanger No. 10, Plate 6, or from the external heat exchanger. The stillage from the stripping column consists of hot water containing dissolved and suspended feedstock solids not removed by the separators and dead yeast cells. The stillage is pumped from the stripping column to the stillage holding tank (No. 7, Plate 1). Approximately 25% to 40% of the hot stillage can be reused in the next cook batch. This accomplishes a substantial savings in process water and energy consumption since each cook begins with preheated water. As the amount of stillage that is recycled in subsequent batches increases, mixer motor load increases and solid-liquid separation become more difficult. Very high rates of recycling (i.e. greater than about 40%) may impair fermentation. The stillage that is not recycled can be sold as a liquid feed or fertilizer or discharged to an outside holding pond. If treated as a waste, local regulations must be followed as the stillage is usually high in B.O.D. and total solids, and can create an odor problem if not disposed of properly. This system consists of a 2300-gallon plastic water storage tank, pump and pneumatic tank as shown on Plate 1 (Nos. 3, 4, & 5). Warm water from the outlet of the water-cooled heat exchanger in the distillation section (No. 10, Plate 6) and from the external heat exchanger (No. 19, Plate 1) is piped into the water holding tank. This water may then be used in the next cook batch, as plant washdown water, or directed to the softener and used as boiler feedwater. The method of wiring the plant will depend on its location (indoors or out), layout and size. In general, an electrical contractor should be contacted to do this work as it should all meet the National Electrical Code and any other applicable local codes. Excluding front-end equipment, plant electrical demand can be met by a 20 kVA transformer. A roller or hammer mill may significantly increase this requirement as will a feedstock storage and handling system. Three phase service of at least 220 volts is recommended for motors above 1-2 horsepower to increase motor reliability and useful life. Before purchasing or processing a feedstock its potential alcohol yield should be established. If the feedstock is a well-known commodity, its potential alcohol yield can probably be obtained from books or other literature. If not, a sample should be sent to a laboratory for starch and/or sugar analysis. It should be remembered that the values obtained from lab analysis may not be directly indicative of the practical yield obtainable. The lab procedure may vary in method as well as in scale from plant procedures and the starch or sugar identified may not be fermentable. Feedstock evaluation should provide the plant operator with an idea of the potential alcohol yield and practical alcohol yield obtainable. Receive and store the feedstock so that its quality does not diminish. Clean the feedstock to protect processing equipment and insure feedstock quality. Reduce the feedstock particle size so that the starch or sugar can be recovered most economically. The types of equipment used to accomplish these tasks may vary depending on feedstock type. In any case, the equipment must all be well-maintained and its performance monitored or periodically tested. The weight of the cleanings or rejected material should be recorded so that the plant operator is aware of what percentage of received material is actually used as feedstock. Milling is one of the very important steps in processing. Before processing large amounts of any one feedstock, some initial batches should be run to determine that particle size which results in optimum process efficiency. A finer grind aids in alcohol recovery but may hinder recovery of the processed feedstock. Once the optimum size is known, and the mill is adjusted to deliver that size, frequent monitoring of mill performance is necessary. A sieve analysis is most often employed to monitor the grind. Before the feedstock is further processed, it should be weighed. Any suitable and reliable weighing equipment can be used. This final weighing is the first step in batch processing. The origin of the feedstock should be recorded on a suitable form along with the measured weight and date of processing. Starch feedstocks must undergo a process that breaks the starch down into fermentable sugars. The sugars can then be utilized by yeast to produce alcohol and carbon dioxide. The plant shown on Plate 1 is designed to use enzymes to accomplish starch breakdown. When employing enzymes, there are actually two steps to the breakdown process. The first step is to heat the water/feedstock mixture in the presence of an enzyme. This step, called cooking or liquefaction, breaks the individual starch molecules out of the tight feedstock matrix. Also, these starch molecules are partially hydrolyzed or slightly reduced in size to 'dextrins'. The second step in the enzymatic process, termed 'saccharification' is to convert the dextrins to the fermentable sugar glucose. This is accomplished with the aid of a second enzyme which is added to the mash after cooling it from cooking temperatures. The enzyme used for liquefaction is called an alpha amylase while that used for saccharification is termed amyloglucosidase. These two enzyme varieties are available from many manufacturers. Each of these manufacturers can provide specific information regarding the recommended use of their product. In practice, these recommended procedures should be tested and modified to provide optimum results with that feedstock being processed. Approximately 600 gallons of hot water and/or stillage at 170 degrees F is added to the cooker. To prevent mixer motor overload and separating and fermentation problems, not more than 300 gallons of stillage should be used without previous testing. For most grains, the amount of liquid used at this time is about 20 gallons per hundred weight of grain to be cooked. The mixer is started and the pH adjusted to 6.0-6.5 with lime. Approximately 1.8 pounds of Miles Laboratories' alpha amylase, called Takatherm, is added. The amount of Takatherm added at this time is about 0.06% of the dry weight of grain to be used. 3000 pounds of ground wheat screenings are added to the cooker at a rate that will allow efficient slurrying. Steam is admitted to the cooker to maintain the 170 degree F temperature. The rate of steam addition to the cooker is increased to the point where faster heating prevents efficient agitation. The mash is heated to 210 degrees F and held at that temperature until complete or near-complete liquefaction. The hold temperature and time depend on feedstock type; for example, barley can be liquefied more easily than corn or wheat. The mash is rapidly cooled, first by the addition of sufficient cool water so that the brix reading is in the 16-20 range. Once the mash is below 190 degrees F, an additional 0.9 pounds of alpha amylase is added (approximately 0.03% of the dry grain weight). The mash is further cooled to a maximum temperature of 140 degrees F, by pumping it through the external tube-in-tube heat exchanger. The pH is adjusted to 4.0-4.4 with dilute hydrochloric acid. Approximately 2 pounds of Miles Laboratories amyloglucosidase, Diazyme, is added to the cooker (approximately 0.07% of the dry grain weight). The mash is held at not more than 140 degrees F for one to two hours and then separated. Solid-liquid separation involves recovery of that portion of the feedstock which cannot be reduced to a fermentable form by the cooking and conversion processes.. Separation may take place either before or after fermentation -- this choice must be made by the individual plant operator. (It could even occur after distillation, however this is difficult for continuous distillation where low flow rates are involved.) Separation before fermentation alleviates the problems associated with handling a heavy slurry (mainly mixing and additional cooling). However, separation after fermentation may result in the recovery of additional alcohol from the feedstock. To separate, the mash is first pumped to the Sweco (No. 13, Plates 1 and 2) using the variable speed, air-diaphragm pump shown on Plate 1 (No. 16). The pumping rate can be controlled at the Sweco by varying the amount of air reaching the pump via an overhead airline. The Sweco can separate a grain mash at about 600-900 gallons per hour when using the 64 TBC screen as specified in Appendix A. The liquids flow by gravity, via a two-inch hose, to either a fermenter or the beer well, depending on where in the process separation is accomplished. Solids discharge from on top of the Sweco's screen into the inlet hopper of the screw press. The press, No 12, Plates 1 and 2, continuously squeezes excess liquids from the mash solids and discharges the solids into the mash storage bin. The liquids from the press are caught in its catch basin and pumped back on to the Sweco screen. Due to their chemical composition,some feedstocks naturally press drier than others. High protein ( in grains) and pectin (in fruits) make feedstocks containing these slippery and difficult to press. Pretreatment with enzymes (protease or pectinase) can break down these substances and greatly improve press performance. Incomplete starch conversion can make the feedstock slippery and difficult to press. Complete starch breakdown is necessary for efficient press operation. Feeding solids to the press too rapidly will result in either a choked inlet hopper and eventual overflow or motor overload. Alternatively, it will require reduced discharge door pressure resulting in greater throughput but yielding a higher moisture product. A faster auger speed will result in greater press capacity. It will also necessitate the use of more power to exert the same pressure without motor overload. The length of the blank auger tube section, at the end of the screw, plays a critical role in efficient press operation. A longer blank section increases the pressure at the end of the screw, usually resulting in a drier product. However, increased pressure requires more horsepower and reduces throughput. A shorter section is required for materials that press very dry. The pressure exerted on the press cake by the discharge door will also vary the cake dryness and press capacity. The press should be adjusted so that the blank tube length alone provides most of the back pressure while the door acts as a fine adjustment. The mash.storage bin is filled by the gravity discharge of pressed feedstock through a hinged door in the top of the bin. Except when separating, this door remains closed. When the mash is to be shipped or used, it can be removed from the bin by opening the full-width doors on the front of the box and using a front-end loader. Periodically, the box should be rinsed clean with water and then sprayed with a dilute mixture of bleach and water. This will prevent a buildup of harmful micro-organisms in the mash storage bin. The fermenters may be filled either with the liquid discharged from the Sweco or with the whole mash (probably requiring installation of fermenter mixers). In either case, the volume of liquid sent to the fermenter should be recorded, along with the brix reading, pH and temperature. In general, the brix reading should be approximately 16-20. Variations from these figures will necessitate adjustment in the amounts of water added to the batch during cooking. The pH should be approximately 4.0-4.5 and the temperature 80-95 degrees F.
The next important step is to add distillers' yeast to the batch. There are many yeast manufacturers and each will provide instructions on the use of their yeast and the desired fermenter conditions (brix, pH and temperature) upon yeast addition. To promote rapid fermentation, the yeast should first be added to a starter tank. This tank should contain a small portion of the fermentable liquid mixed with water and adjusted to optimum fermenter conditions. The yeast should be allowed to propagate in the starter tank for 15-30 minutes before being sent to the fermenter. As fermentation commences, the yeast will consume the fermentable sugars and yield mainly ethanol, carbon dioxide gas and heat. Ethanol will remain in solution while carbon dioxide gas will rise through the liquid and fill the head space in the fermenter. The carbon dioxide can be piped out of the top of the fermenter and allowed to flow to the mash storage bin. If the heat released by the reaction causes the fermenter temperature to rise to 95-100 degrees F it must be removed or the yeast could die. This can be done using the external tube-in-tube heat exchanger via a pump and hose connections. The need for fermenter cooling will depend on batch size, feedstock type and outside air temperature. The pH should be monitored throughout fermentation and a value much below 3.5 usually indicates that some bacterial contamination has occurred. The existence of organisms other than yeast in the fermenters generally will cause a decrease in ethanol yield. Better fermenter cleaning prior to filling is required and additional care must be taken so that the mash is not exposed to competing microorganisms prior to fermentation. Fermentation is complete when there is no further evolution of carbon dioxide gas. This usually requires 48-72 hours. The tank contents are either pumped to the beer well or to the Sweco (for fermentation with solids). The fermenter should be emptied completely, rinsed with water and then cleaned with a bleach solution or steam. The distillation unit shown on Plate 6 is designed for continuous operation. There are many variables affecting system performance, each of which must be understood and controlled within certain limits for satisfactory operation. The pressure at which the columns operate affects the system in two ways. First, the relationship between the boiling points of ethanol and water varies with pressure. And second, the pumps in the distillation section are selected based on a certain operating pressure. The distillation unit shown on Plate 6 is designed to operate at atmospheric pressure by venting through the reflux drum. The beer feed can vary in its alcohol content, temperature and rate at which it is pumped to the columns. All three of these variables affect steam useage. The beer feed rate and the quantity of alcohol in the beer determine the alcohol output from the columns. For economical operation, the beer feed should contain a minimum of about 7% alcohol by weight. The columns shown on Plate 6 are designed to handle a beer flow rate of between 90 and 140 gallons per hour. The rate at which alcohol is refluxed back to the top of the rectifying column affects the proof of the final product and system heat consumption. A high reflux flow results in higher proof alcohol but also significantly increases heat demand. The reflux flow should be maintained at the minimum rate which provides desired product quality. The amount of heat supplied to the base of the stripping column is primarily determined by reflux flow and the inlet beer feed temperature and rate. Insufficient heating will result in alcohol being lost out the column bottom. Too much heating requires the use of additional boiler fuel and condenser cooling and may unnecessarily raise operating costs. The heating rate should be adjusted so that the temperature at the base of the stripping column is maintained at about the boiling point of water for the particular absolute system operating pressure. Heat must be removed f rom the alcohol vapors by the condenser system. If the condenser does not remove enough heat, then alcohol vapor will be lost out the vent and/or no amount of reflux will be sufficient to cool the rectifying column and obtain high-proof product. Excessive heat rejection allows the use of too much cooling water which may unneccessarily raise operating costs. Check to be sure instrument air is being properly supplied to all pneumatic controls (Nos. 4 and 12). Slowly admit steam to the base of the stripping column. When the steam has reached the base of the rectifying column, turn on beer feed pump (No. 10, Plate 1) and slowly initiate beer flow. Turn on pumps (No. 6) at the bases of both distillation columns; turn on condenser/subcooler fan (No. 9) and subcooler (No. 10) cooling water. When vapor reaches the top of the rectifying column, turn on reflux pump and set reflux controller (No. 12) to initiate automatic temperature control. Adjust cooling water flow to maintain desired reflux drum temperature. Adjust beer feed rate to final, desired value. Adjust steam rate to maintain proper operating temperature at the base of the stripping column. Measure final product proof after system has stabilized and adjust reflux controller and steam flow to provide desired proof with minimum energy consumption. After start-up, the system will stabilize and remain so as long as there are no variations in external inputs (i.e. changes in steam temperature, pressure or flow rate, cooling water temperature or flow rate or beer feed enthalpy). Periodic observation and adjustment or additional automatic controls are needed to insure continuous product quality. Efficient boiler operation is very important since it provides most of the process energy to the plant. The boiler should be installed, operated and maintained according to the manufacturer's directions. In addition, boiler efficiency should be regularly tested. Inefficiency can usually be attributed to improper feedwater treatment and subsequent fouling problems, lack of feedwater pre-heating, or improper burner adjustment. Any of these problems should be corrected as soon as possible. The two heat loads placed on the boiler, distillation and cooking, both require only low-pressure steam. The operating steam pressure should be selected based on the magnitude of these two loads and the steam piping distances required in the plant. Local, state and federal regulations may also affect the selection of a certain operating pressure. The boiler shown on Plate 1 operates at 30 psig. The distillation portion of the plant shown on Plates 1 and 2 is designed to operate continuously, 24 hours per day. Nominal production capacity is 10 gallons per hour of 190 proof ethanol. Based on operating six days per week, annual ethanol production is 70,000 to 75,000 gallons. In addition to ethanol, the plant produces one or more saleable coproducts, depending on the base feedstock type. Using grain feedstocks, continuous operation would require about three tons per day. Processing would yield the ethanol as well as approximately three tons per day of a high-protein, high-moisture feed supplement. Approximately 2500 gallons of stillage would also be produced on a daily basis, at least 25% of which could be recycled into following cook batches and the remainder sold as a liquid feed supplement or fertiizer. Most of the process energy consumption is due to steam useage in the cooking and distillation sections of the plant. The amount of steam used in cooking can vary widely depending on the feedstock type and plant operating schedule. Sugar-based feedstocks may not require any cooking while some starch feedstocks (wheat and corn for example) require high cooking temperatures and long hold times. When the plant is operating continuously, there is recycleable hot water and stillage available whereas if it is operated only intermittently this may not be the case. Typical cooker steam useage is illustrated in Table 1. Steam useage in distillation can vary widely depending on the operating reflux ratio, percent alcohol in the beer and amount of beer preheat. Typical steam requirements for distillation are illustrated by Table 2. The example shown is for distillation of a typical 3000 lb batch of wheat screenings yielding approximately 1200 gallons of 10% by volume ethanol beer. This could be pumped to the stripping column at 120 gallons per hour. In passing through the two stages of beer preheat, it would be heated to approximately 180 degrees F before entering the stripping column. The ethanol would be vaporized at the top of the rectifying column at about 173 degrees F. A reflux ratio of approximately 3 to 1 (reflux 36 gallons per hour for a product rate of 12 gallons per hour) would be required to obtain 190 proof product. The stillage would pass out the base of the stripping column at about 212 degrees F.
Tables 1 and 2 show that efficient values for total steam energy consumption, when processing a grain-type feedstock, is 20,877 BTU's per gallon ethanol (2,441 BTU/gallon for cooking and 18,436 BTU/gallon for distillation). This excellent efficiency is obtained only with recycling of hot liquids, good boiler system maintenance and complete insulation. Appendix C presents a more thorough discussion of plant energy use and illustrates the sensitivity of the energy use figure to operating procedures. Plant electricity use is illustrated in detail by Table 3. 1. Based on 24 hours per day production at 10 gallons per hour; excludes feedstock processing which is very feedstock dependent. 2. For pneumatic controls and air-operated pump. 3. Lights, boiler controls, water softeners, etc. at 20% of plant total. Almost all components of this plant can be either built in a well equipped farm-type shop or purchased as standard, off-the-shelf items. In either case, there are several general construction guidelines to follow. First, all equipment should be reliable and not require excessive maintenance. The plant will most likely be operating on a more or less daily basis and breakdowns can be both discouraging and costly. Second, except in a few cases to be noted later, common materials of construction are suitable as opposed to the use of costly stainless and/or copper. (It should be noted that some lower-cost materials may increase the risk of product contamination. If the plant is intended to produce human food or pharmaceutical-grade products the use of stainless and/or copper is necessary.) Third, the plant should be built on a well-drained concrete floor for cleanliness and ease of operation. A roof provides added protection and allows year-round production. Detailed construction guidelines for each portion of the plant are described in the following pages. The particular front-end equipment that is bought or built will depend on the feedstock(s) to be utilized in the plant. In general, it is not difficult to find people that are very knowledgeable in materials handling that can specify appropriate equipment. In the feedstock processing portion of the operation particular attention should be given to dust contol, for sanitation, health and safety reasons. In addition, this operation should be somewhat separated from the rest of the plant because of the dust and noise that accompany feedstock storage, handling and preparation. The size of the cook tank depends on the size and number of batches to be processed each day. It could be considerably smaller than shown on Plate 3 if desired. (It could even be a continuous type). lowest portion of the tank. The relationship of each paddle's position to the others is necessary to provide an approximately even motor load. To install the agitator, the shaft must be lowered into the tank through the manhole without the paddles attached. The paddles are welded to the shaft inside the cooker. Each of the two steel tank support pillars has a 6" wide metal band across its top to spread the load weight and each has a vertical gusset in the middle to add additional strength. The two pillars are cross-braced between each other with 3" x 1/4" flat bar. This tank stand was designed expressly for the cooker shown on Plate 3 . Any variation in design should be approved by a licensed engineer due to the substantial load placed on the stand by the cooker and its contents. The steam distribution pipe for the cooker is a 1-1/4" diameter perforated steel pipe. The holes drilled along its length allow even distribution of the steam thoughout all the mash. The external heat exchanger consists of one copper pipe placed inside another, as described in the Plant Equipment section. On the ends of the large pipe are welded 'tees' with one end capped and drilled out to accept the smaller pipe. All joints are then soldered shut. Two-inch hose fittings are placed on the smaller pipe and the tees provide the cooling water inlets and outlets. This heat exchanger should include at least 20 feet of pipe length but more is desireable. More heat exchange surface will provide hotter cooling water for recycle and shorten cooling times. Additional pipe lengths can be similarly constructed and either hard-plumbed together or joined with short hoses. The Sweco is an off-the-shelf item that does an excellent job of first-stage separating. Manufacturer's instructions should be followed closely for maintenance and for piping away separated liquids. Explicit details of screw press construction are shown on Plates 4 and 5. Construction should begin with fabrication of the channel iron frame. The flange block support plate should next be welded into place and then the drive shaft, with attached screw, mounted through the bearings. The screw tube should be fabricated so that the screw turns inside with minimum clearance against the tube. The tube bands should next be slipped on the tube. The tube can then be slid over the mounted screw and connected to the press frame at the tube band on the flange block support plate and by attaching ears from each of the other tube bands to the press frame. The front tube and door support plate should then be fabricated and attached to the press frame and screw tube . The next step is to mount the intake hopper by bolting it to the folded sides of the screw tube and to the flange block support plate. Finally, the catch basin, door, door springs and drive can be added, to complete the assembly. The mash storage bin should be strong enough to hold a certain size load of wet mash. It should be sized in accordance with the mash production and use schedule. Bin design will also depend on the unloading method chosen. It is recommended that the bin be lined with wood that has been treated with a moisture sealant, as conditions inside the box are conducive to corrosion of most metals. Also, provision should be made to allow and direct drainage of excess liquids from the mash. The fermenters are standard plastic tanks available from a number of manufacturers, (The fermentation vessels used can be of steel, stainless, or other suitable material but the plastic is economical and easily cleaned and maintained.) They are tilted and placed on stands to facilitate drainage. Depending on the actual tanks used and materials available for stand construction, tank stands can be made in a variety of forms. The design chosen should be approved by a reputable engineer due to the substantial load of the fermenter and its content. The distillation section consists basically of two standard 8-inch diameter pipes, containing internal sieve plates and fitted with a variety of equipment to affect and control the distillation process. Each column is constructed in three basic sections. The bottom section has a welded-in floor, fittings for necessary equipment connections and a flange at the top to allow connection to the next section. The middle section of each column contains all the sieve plates. These are all previously assembled on two support rods and pulled into the middle column section as a unit. The section is attached to the lower and upper sections at each flanged end. The upper column section contains a vapor disengaging space and the necessary connection to subsequent piping. Column internals are as shown on Plate 7. The first step in making these sieve plates is to first circle-cut each of them and then cut off a portion of the circle as shown. The plates can then be placed in a jig and the holes drilled. Next, the downcomers should be fabricated to the dimensions shown and attached to the plates. Finally, the plate and downcomer support should be attached to make a fully assembled plate. The plate and downcomer support provides structural rigidity to the assembly as well as providing a tight seal with the distillation column wall. All of the plates should then be joined with the 1/4" rod and pipe supports. The end of the rod can be threaded and nuts attached to keep the entire assembly together. Following construction of the basic columns with their internal sieve plates, the columns should be moved into position, leveled and supported as necessary. The rest of the distillation system can then be fitted and plumbed as shown on Plate 6. The columns and internals may be built entirely of mild steel. Equipment constructed of these materials will have a limited operating life however, due to the conditions of high temperature and low pH that characterize the distillation process. Under continuous use, the operating life of mild-steel sieve plates will probably be three to five years. Stainless steel should be considered as an alternate construction material for this equipment, although its substantially higher cost and more difficult workability should be recognized. An alternative to a plate column would be to use packing in the rectifier and even in the stripper for a clear beer. The design and operation of a packed column is dependent on experience with the particular packing used, so an individual packing manufacturer should be consulted for more information on this alternative. Upon installation the boiler must be plumbed to receive softened and preheated feedwater. Also, steam supply connections must be made to the cooker and distillation columns. The diameter of steam piping to the points of use must be based on the boiler operating pressure and the distance from the boiler to the loads. For the plant shown on Plates 1 and 2, 1-1/4" diameter black pipe was used. At both the cooker and the columns, steam flow can be controlled most simply by a steam pressure regulator. These simple regulators may not provide sufficiently accurate control, especially for distillation, and a more sophisticated flow control may be required. The thin stillage recovery system shown on Plates 1 and 2 is basically another plastic tank. Depending on the final use of the stillage, as discussed in the Plant Equipment section, this may or may not be sufficient. Whether the stillage is treated as a waste or sold as a coproduct, it can be handled with conventional methods. There are four basic guidelines to remember when handling stillage. First, it has heat available for recovery when it exits the distillation section. Second, it contains dissolved and suspended solids (usually about 4-6% for a grain feedstock) some of which settle out quickly in holding tanks. Third, it is generally low pH. And last, it spoils quickly, especially in warm weather, and may create an odor problem if it does. The warm water storage system is a standard pressurized water storage and distribution system. The recycled warm water can be plumbed throughout the plant as needed. When used as boiler feedwater, this recycled water should be softened and may then be further heated with stillage or boiler exhaust. The plant equipment and process should be tailored to provide optimum efficiency when using a particular feedstock. To achieve economical operation, every effort must be made to recover as much marketable product (alcohol , mash and/or stillage) from the feedstock as possible. Also, it is important to reduce the need for process energy and labor to a minimum. Effective cooking procedures for different feedstock vary widely. The various enzyme manufacturers should be consulted for advice on recommended procedures and some experimentation with different enzymes and/or procedures is recommended. Also, the amount of energy required by the cooking process depends very much on the temperature at which steam addition begins. Thus, every effort must be made to use recycled hot water and/or stillage. Continuous cooking in a pipe, auger, extruder or other device may be considered in some cases. Efficient solid/liquid separation is very important since the recovered solids are one marketable product and the amount of liquid obtained directly affects alcohol yield. Any fermentables that accompany the pressed mash to the mash storage bin will reduce the practical ethanol yield of the feedstock. Thus, the mash must be pressed as dry as possible. In addition, it may be necessary to wash the mash before discharging it to the bin to recover some of these otherwise-lost fermentables. To remove every bit of alcohol from the beer and produce a high quality product, the distillation process requires either periodic attention or complete automation. Temperature fluctuations from set points (i.e. 212 degrees F at base of stripper and 173 degrees F at top of rectifier at sea-level) will either result in wasted beer feed (temperature at base of stripper too low), use of excess steam (temperature at base of stripper too high) or low quality product (temperature at top of rectifier too high). Also, when processing a grain-type feedstock, labor requirements outside of monitoring the distillation process are only about 30% of the operating period (i.e. plant operation throughout a 24 hour period requires about 8 hours of labor to cook and separate). Thus, complete automation of the distillation process will insure energy efficiency and product quality and significantly reduce labor requirements. For complete automation, in addition to the distillation controls previously described, a sensitive steam flow controller is recommended. This controller would maintain the base of the stripping column at the set temperature by modulating the steam flow. Also, there should be equipment failure alarms or interlocks to shut down the system. On start-up or shut-down, when the columns are below operating temperature, any alcohol discharged with the stillage should be recycled back to the beer well. This can be done either manually or with temperature-controlled valves. Using the basic design of this plant, production capacity can be fairly easily scaled up or down. Production can be decreased by operating the plant less often or downscaling equipment. In either case, the payback period and/or operating costs may be increased over a larger-scale operation. This may not be true if labor is relatively cheap for a smaller-scale operation or if high product quality is not necessary (personal or on-farm use), allowing less automation and energy use. An increase in plant capacity could be realized by increasing the diameter of distillation columns (and making appropriate changes in column internals), and increasing the size of tanks, pumps, piping, boiler and other process machinery accordingly. By increasing the production capacity of the plant without significantly increasing the labor requirement, operating cost can be reduced substantially.